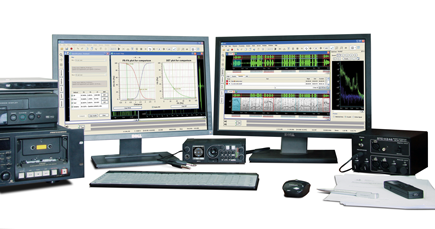 Professional hardware and software suite for speech signal analysis. 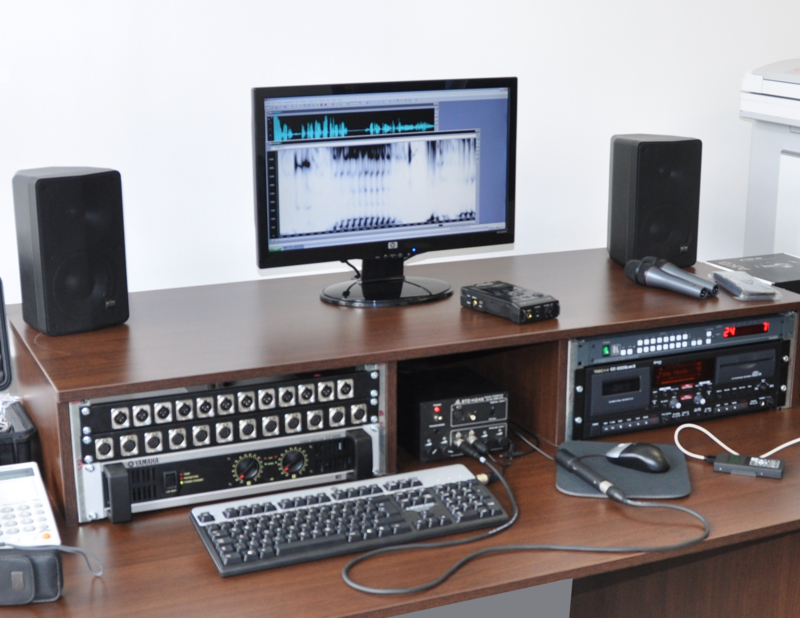 Since it has been launched in 1992, IKAR Lab has evolved from a sound editor application to the most popular audio forensic lab in the world. Today it is serving experts in 350 laboratories in more than 40 countries worldwide. 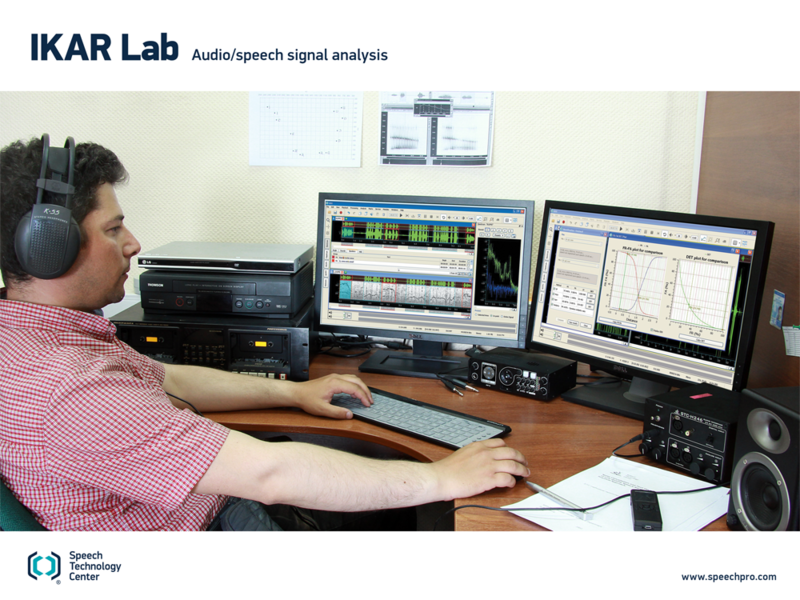 IKAR Lab is a professional hardware and software solution for advanced speech signal analysis. It provides the capabilities to perform a multitude of valuable audio processing, analysis, audio restoration and voice comparison functions. IKAR Lab makes possible to perform an in-depth analysis of voice and speech by numerous visualization tools, automated and human-assisted comparison instruments. Draw FFT or LPC sonograms, adjust brightness, contrast or normalization. Choose the proper frame size, weighting windows and other parameters on the fly. Or you can use default presets. Use spectrum in the point to overlay formants to comparison more visual. Draw cepstrum for pitch and melodic pattern analysis. Selected audio fragments can be easily assigned to particular categories (e.g. different speakers or sounds) and speech fragments can be transcribed and displayed as text. The marked fragments can be selected with a single mouse click to be saved in a separate file, or muted, or deleted, or played back, etc. Text comments to marks can be exported to MS Word as a text document – text transcription. A “similar words” search function finds words that repeat in two text transcriptions, which is useful for voiceprint analysis. vertically for identification purposes, horizontally for authentication and noise reduction or customized according to user preference. Signals can be layered for easy comparison. Colors and transparency can be changed to ease readability. Windows can be connected according to time and spectral domain, which makes measurement easier using vertical and horizontal cursors. Spectrograms are automatically redrawn when parameters are changed and a wide variety of settings ensure optimal clarity. The instant spectra can be overlaid for better visual comparison. Fundamental frequency histograms can be compared visually or numerically using values of minimum, maximum, median, asymmetry and general correlation. With projects, users can keep all files related to an investigated case together, whether it’s an audio, text, video or photo files. All these files can be opened directly from the software. Identification results can be saved in projects for further reference to ensure a smooth workflow, as can reports created in MS Word. With export/import function projects can migrate from one workstation to another. Sofwatre also enables screenshots, which are useful to illustrate the investigation process. Information about visible speech settings is always available and can be easily copied to illustrations. Thus, users can easily produce fully detailed and illustrated text reports to reinforce expert testimony in court. The speech detector automatically marks speech fragments in the audio signal that are suitable for identification. The module can also be configured to detect noisy areas: dial tones, clipped fragments, and clicks. IKAR Lab allows you to automatically detect speech fragments pronounced by two different speakers and to mark them accordingly. IKAR Lab provides unique and powerful tools for speaker comparison. Automatic voice biometric algorithms paired with human-assisted analysis modules are invaluable in automating time-consuming identification tasks, such as searching for comparable words, sounds and pitch patterns, matching pitch, formants and producing numeric results. They also contribute to overall conclusion-making, whether it’s an identification or elimination. This plugin enables step-by-step identification process and visualizes the results for any comparison made. Identification results are not only returned for each matching method, but also as a fusion decision. All results are based on the extraction of voice biometric traits and calculations regarding their similarity. The matching probabilities were derived using a massive speech corpus containing tens of thousands of speakers, different recording sessions and channel types. However, the statistical approach of 1-to-1 comparison considers the possible distribution of values. Thus, in SIS II, results are issued along with an account of confidence level. The high reliability of SpeechPro’s automatic identification algorithms is attested by NIST results. comparison process can be launched. The algorithm automatically calculates within-speaker and inter-speaker variability and provides an identification/elimination decision or produces an inconclusive result. Export of selected sound tables and results to MS Word. The pitch comparison module compares the specificities of speakers’ melodic patterns. The module enables melodic fragments to be selected, attributes them to 1 of 18 possible melodic types and compares them according to 15 parameters, including maximum, average and minimum pitch values, rate of pitch change, bevel, kurtosis and others. The algorithm generates results in the form of a match percentage for each parameter and delivers an overall identification/elimination decision or an inconclusive result. All data can be easily exported as text reports. This module compares speakers on the basis of audible specificities of their speech and voice. The database contains 126 features. Each auditory feature is supplemented with a sound sample. Users can estimate a presence of a particular feature in the speech of each speaker. The results of auditory comparison are presented as a list of matched and mismatched features with text conclusion. Users can expand the database by adding their own features and samples. Gathering together intermediate results from the various analyses engaged in voice ID, the system arrives at an overall conclusion. User experts can adjust the weight of each method in the overall conclusion or weights can be automatically assigned depending on audio quality. Nowadays, law enforcement agencies (LEAs) tend to keep all forensic trace evidence in regularly updated and well-structured databases, a good practice that allows for quick suspect identification in instances of repeat crime. While fingerprint, ballistic and facial databases have already been widely adopted by LEAs, voice databases are only starting to find their use. VoiceGrid Local provides essential forensic database management and voice identification functionality. Any voice recording that forms part of an investigation is added to the database with an accompanying case description, along with information and photos pertaining to the speaker. Voice matching in VoiceGrid Local is carried out using proprietary processing, feature extraction and voice identification methods. VoiceGrid Local performs a biometric search of probable speakers across the entire voice database or in a desired section. Unidentified voice recordings can always be compared with the samples available in the database. Client-server architecture of the product allows for remote access to the database. Access policy is highly secured and flexible. Form of voice biometric search results List of most similar voice samples in descending degree of similarity. Perfect for beginners and audio professionals alike, Sound Cleaner II noise reduction software performs a full spectrum of noise filtering and sound enhancing tasks. Audio enhancement and filtering is fundamental in law enforcement and private agencies that handle audio evidence. Whether the aim is to eliminate interference to improve voice clarity or to remove background noises for better analysis, Sound Cleaner II noise reduction software is the ideal solution. Sound Cleaner II uniquely combines state-of-the-art noise filtering algorithms and speech enhancement tools in one product. Each module can be easily activated and combined with others in the filtering workflow, so that any changes in the audio can be heard intelligibly and on-the-fly. Find more info about Sound Cleaner II. ANF II gives professional results while being intuitive and easy-to-use, requiring no special knowledge in digital sound processing. Adaptive noise filters yield immediate results and allow adjustments to be instantly audible. All settings and controls can be adjusted via the front panel of the device, remotely via web-interface, or from the computer via USB cable. When connected to a local network, ANF II works as a full-fledged noise-processing server. ANF II can be controlled and all the settings can be adjusted remotely via web interface. ANF II improves the quality and intelligibility of speech signals recorded by the device or uploaded to its removable memory card. Find more info about ANF II. EdiTracker is a unique software module of SIS II designed to make assessments regarding audio authenticity. EdiTracker significantly enhances SIS II functionality, extending its capability in revealing modified, edited or doctored audio. "The advent of digital audio made it far easier to tamper with recorded evidence. But it also gave investigators a host of new and powerful tools. Improvements in forensic-audio software have given the field a big boost. Allen (Stuart Allen, forensic audio expert), for example, used a software package called EdiTracker 2.0 to dissect his doctored recording. First he played the audio file for the audience and displayed its spectrogram on a projection screen. Then he punched a key on his laptop. Within seconds, EdiTracker had scanned the file and flagged a bunch of "feature discontinuities" - unexpected bumps in frequency and amplitude, miniscule gaps and other unusual events. They're undetectable to the naked ear, but could indicate tampering." Each analog recorder has its own characteristics such as frequency response, total harmonic distortions, detonation, amplitude modulation, and speed. EdiTracker automatically assesses these characteristics using a test signal. Finding a mismatch between the recorder’s parameters and characteristics of a signal that was allegedly recorded with a given unit can be an indication of tampering. Digital processing of analog signals requires a specific sample rate. During the digitizing process of an analog signal, a phenomenon called aliasing occurs. To avoid this phenomenon, the vast majority of analog-to-digital and digital-to-analog converters use anti-aliasing filters. EdiTracker automatically searches for traces of the filter, which may be reminiscent of analog nature of the original audio or previous digitizing at a lower sampling rate. EdiTracker automatically scans the audio for technical narrow-band signals which normally come from an electrical network (ENF), batteries, nearby electrical appliances etc and estimates their phase continuity. Unjustified phase break may be interpreted as a possible editing point and should be subject to further auditory and instrumental analysis. Background scanning procedure is the detection of the dramatic change in the spectrum unnoticeable on the waveform related to possible audio editing. EdiTracker automatically scans the integrity of background noises marking the abrupt change of noise level. EdiTracker provides an access to the step-by-step instructions for the auditory-linguistic analysis and to the extended list of indicators of a recording authenticity breaches making it possible to create a detailed list of linguistic features of tampering and further use them in a text report. Unlike investigated recordings, voice samples are supposed to be taken in controlled conditions and therefore should provide audio quality sufficient for robust analysis. However, forensic experience of our clients proves that it is not always like that. 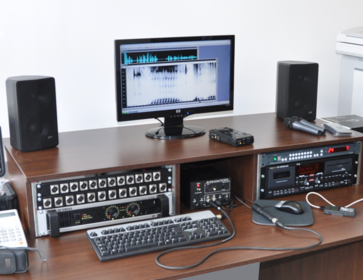 Audio samples taken with low-grade pieces of equipment or in highly reverberated and noise environment make a lot of troubles for forensic audio examiners. 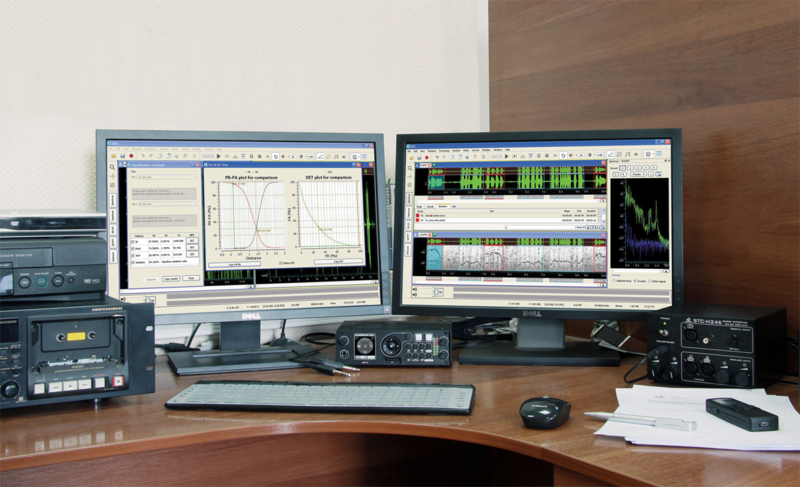 IKAR Lab is optionally equipped with Voice Sampling Workstation (VSW), a complete software and hardware solution for taking voice samples of speakers under investigation. Gnome-P II is used for taking high-quality voice samples in the field. The recorder has the optimal size-function-quality ratio. Its metal casing provides a powerful defense against physical damage and power surges. Find more info about Gnome-P II. VSW includes 1 USB microphone to record interviewer’s and interviewee’s voices and a special software – MultiPassport – which automatically estimates signal quality in real-time mode in terms of its quality and quantity for voice ID analysis. USB Sound Device STC-H246 is designed for analog-to-digital and digital-to-analog conversion of electrical signals. The device provides two-channel (both digital and analog) input and output ports, to PC and as well as monitoring ports to be used by an operator through headphones.